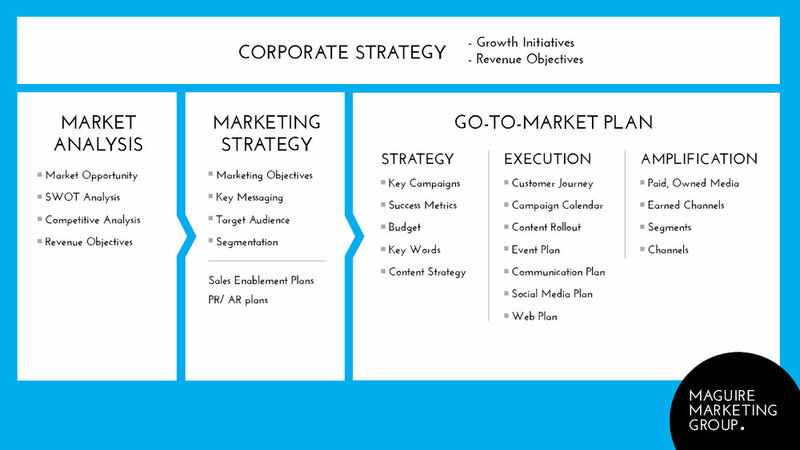 A go-to-market plan includes specific marketing programs, management responsibilities, promotion, and campaign budget. This may also include specific sales by product, by region or market segment, and by channels. Product or Service: Start by looking at your product or service offering. Define your market problem, market position, and how your offering solves this problem. Strategy: Now you need to look at your strategic business objectives. In this phase, your senior executives must meet to decide on how a go-to-market plan will be approached and what its long-term goals are. At Maguire Marketing Group, we use a framework that has been developed over decades of working with both product and service companies. Execution: After you have a strategic plan you need to execute it. Look at what resources you have and how you can get your product, service, or brand seen. How can you execute your strategy? 1. Experiential Campaigns: A way to directly engage customers to take an action and participate in the development of a brand or brand identity. Example: We work in the King & Portland area and in the summer there are brands constantly giving out products or doing things to have us experience the product. Coffee taste tests, free gum, cans of pop etc. 2. Influencer Campaigns: Most successful brands have brand influencers. Influencers are brand advocates that push brand messaging in an organic way on public forums. This is mostly seen on social media. Example: Designers often get “made” when a famous person wears one of their gowns on the red carpet. But this can be done at a more local level. The trend now is to work with “micro” influencers like a mompreneur who might have 25,000 Instagram followers and will promote products she genuinely believes in. 3. Customer Referral Programs: One way of getting people to make referrals for your business is through a deliberate and targeted referral program. Incentivize existing customers to spread the word of their experience with your product or service in order to attract new customers to your business. No matter what your business goals are, they most likely include growth. A well put-together go-to-market plan is necessary at the start of any successful campaign to ensure that you hit your objectives. If you need help getting your go-to-market plan ready for 2019 Maguire Marketing Group may be able to help.